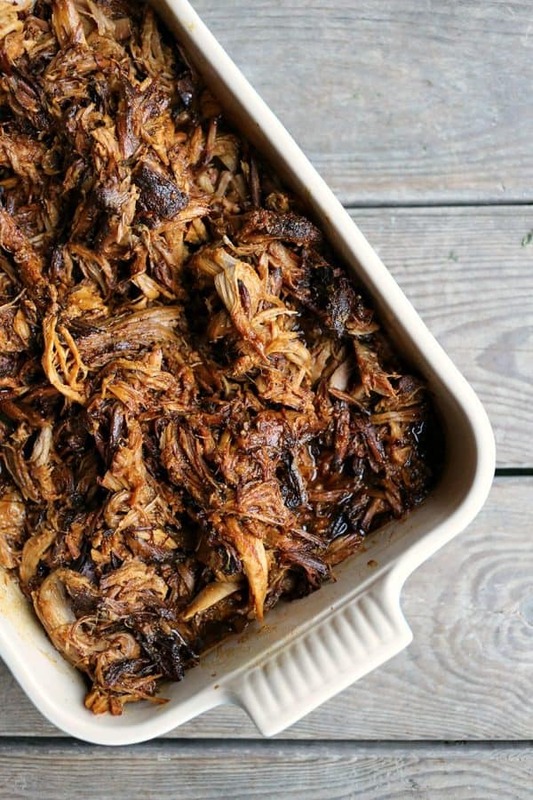 Apple Cider Pulled Pork gives major flavour pay off for minimal hands-on time. 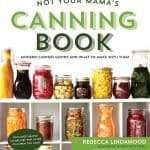 It uses Boiled Cider, which is available on Amazon, but you can just as easily make your own boiled cider using this recipe. Year after year I am gobsmacked by the beauty of fall. But oh, it always goes far too fast and I find myself in the middle of winter dreaming of Autumn. 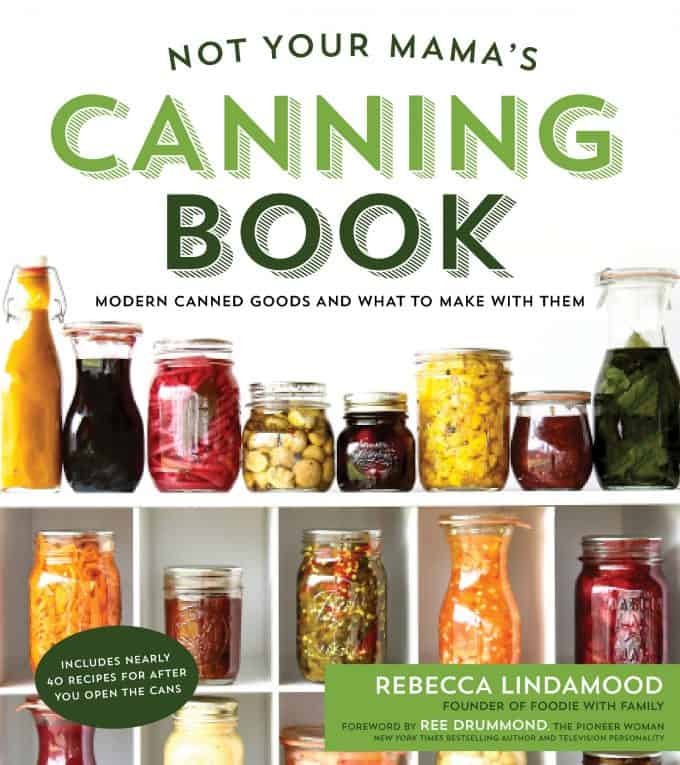 It isn’t just the vivid hues of the leaves or the stacks of squash and pumpkins at roadside stands, although those certainly don’t detract from the view. It’s all of that against a gunmetal grey sky and the full-body experience of chilly winds swirling fallen leaves around your ankles. It is cold fingers warming up against a hot mug of slow-cooker mulled cider or homemade pumpkin spice chai latte. It is a blanket on your lap and a book in your hands while the rain splatters the windows. It’s the intoxicating aroma of Apple Cider Pulled Pork in the slow cooker winding its way to wherever you’re sitting in the house. It greets you like a hug from your mother when you come home and open the door. While many pulled pork recipes use apple cider vinegar, I prefer the slightly sweet, rounder flavour of the boiled cider. It makes for a more comforting, versatile pulled pork that is equally at home on a perfect soft pretzel roll, in a soup, casserole, on a salad, mashed potatoes, polenta, roasted Brussels sprouts, or with bacon fried apples and onions. Apple Cider Pulled Pork -like most of the best things in life- is simple. One bone-in pork shoulder roast, one cup of apple cider syrup (or mulled cider syrup from Not Your Mama’s Canning Book), a couple onions, and a bit of salt go into the slow-cooker. All of the apple flavour for your apple cider pulled pork is from Boiled Cider, as I’ve mentioned. Twelve hours later, you have pork that is so tender it is literally falling away from the bone and almost shreds itself. The pan juices are strained into a saucepan where they’re reduced by about 2/3 then enhanced with a little Dijon mustard (homemade or purchased) and honey. Pour that good stuff all over your shredded pork and toss. You’re in for a comforting taste of fall with Apple Cider Pulled Pork no matter WHAT time of year it actually is. Can I make pulled pork ahead of time? 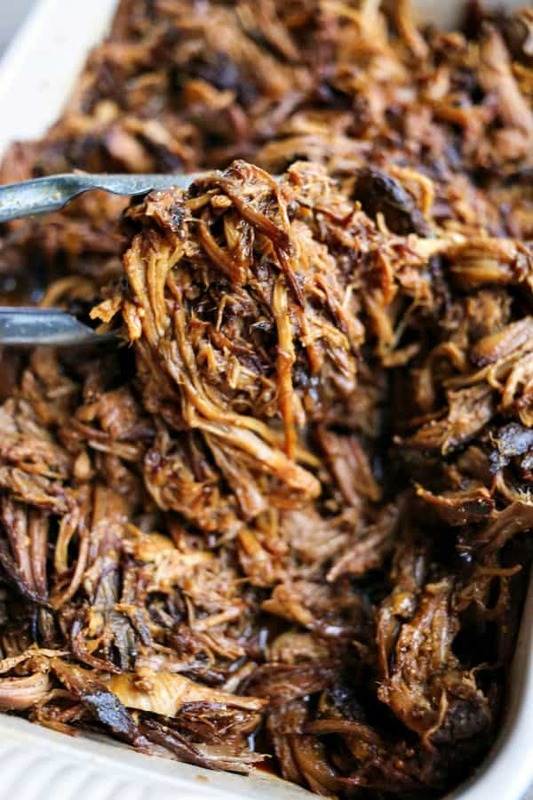 You have a great deal of flexibility with this Slow-Cooker Apple Cider Pulled Pork recipe. I’ve given instructions in the recipe for cooking and serving it the same day. It’s also ideally suited to making ahead of time as you can cook the roast up to 3 days in advance and chill it thoroughly. When you’re ready to finish it, remove the solidified fat from the sauce and reduce the sauce as directed in the recipe. Shred the now cold pork as directed, and transfer to a baking dish. Cover tightly with foil and put into an oven preheated to 350°F until the pork is heated all the way through, about 45 minutes. When it is steaming hot, pour finished sauce over the top as instructed in the recipe and toss to coat thoroughly. Leftovers also freeze like a champ, so don’t be tempted to reduce the size of your roast! This recipe is designed to be made with a bone-in pork shoulder roast. That yields the most succulent, juicy results and best flavour. If you can’t find a bone-in pork shoulder, the next best option is a boneless pork shoulder roast. Third in line would be a boneless center cut pork roast. Those simply don’t pack the same amount of fat and flavour as the more marbled cuts, but will still be tasty if that’s all that is available to you. Guys. Don’t skip the boiled cider syrup, also known as apple molasses. It’s pricey to buy, but ridiculously inexpensive when you make it yourself, and the payoff is immense. If you don’t want to make a full batch, just boil a gallon of plain (not spiced!) apple cider in an open pot until it is reduced to about 2 1/4 cups. Transfer half of that into a jar with a tight fitting lid and pop it in the refrigerator to use for a later Slow-Cooker Apple Cider Pulled Pork roast because you will want to make another soon. Use the other half immediately to make this recipe. A word about the onions: I like to peel them, slice them into thick slabs and lay them on the bottom of the slow-cooker before adding the pork shoulder. I’ve been lazy before, though, and simply peeled them, trimmed the root end off, and popped it whole into the slow-cooker. Both methods work well; I give a slight flavour edge to the slabs at the bottom of the slow-cooker, though. Choose whichever Dijon mustard you like best to add to the Slow-Cooker Apple Cider Pulled Pork. I prefer the whole grain homemade Dijon mustard from Not Your Mama’s Canning Book, but I have also used commercial whole grain Dijon with great results. For the full printable recipe, scroll down! Lay the slabs of onion on the bottom of a slow-cooker crock like a rack. Lay the pork shoulder on top of the onions, fat side down. Sprinkle the salt over the pork roast and rub it in, flipping the fat side up. Pour the boiled cider syrup over the pork roast, put the lid in place, and cook on low for 12 hours. Use tongs to transfer the pork to a large mixing bowl. Strain the pan juices into a saucepan and let rest for the fat to rise to the top. Skim as much fat as possible from the juices then boil to reduce the sauce by 2/3. While it boils, use your hands or two forks to shred the pork, removing the bone and as much fat as possible. Transfer to a casserole or serving dish, and tent with foil. When the pan juices have reduced, whisk in the honey and Dijon mustard before pouring over the pork. Enjoy! Slow-Cooker Apple Cider Pulled Pork: tender, succulent pulled pork in a memorable sauce of apple cider, honey, and Dijon mustard. This is fall at its best! Lay the slabs of onion on the bottom of a slow-cooker crock. Lay the pork shoulder on the onions, fat side down. Sprinkle the salt over the pork roast and rub it in, flipping it to fat side up. Pour the boiled cider syrup over the pork roast, put the lid in place, and cook on low for 12 hours. Use tongs to transfer the pork to a large mixing bowl. Be careful, as the pork will want to fall apart and may splash back into the hot pan juices. Strain the pan juices into a 2 quart saucepan and let stand for 10 minutes to allow the fat to rise to the top. Skim as much of the fat from the pan as possible and then reduce the sauce by 2/3. While it is boiling, use your hands or two forks to shred the pork, removing the bone and as much fat as possible. Transfer to a casserole or serving dish tented with foil to keep warm. When the pan juices have reduced, whisk in the honey and Dijon mustard before pouring over the pork and tossing. Serve immediately or cool and divide into meal sized portions in air-tight containers and freeze for up to 3 months. This post was originally published October 9, 2016. Updated January 2019. Hi – no slow cooker here – kitchen’s too small. What would be the temp and time for an oven bake in a giant Dutch oven? Would it even work? Thanks! Go for the dutch oven if you want. Keep the oven good and low, though! You may need to adjust the timing and play with the temps. I’m imagining between 200 to 250 (which is about what most slow-cookers run.) Check at 8 hours, then keep checking every hour ’til done. I just put 7 cups of cider on the stove to reduce to one cup—I think that’s right??? About how long should I expect that to take? Never mind….it’s going quite fast. OMG, this was delish. Thank you so much for the recipe. My husband is already asking when we can have it again. That is fantastic, Kathy! Thanks! Would the unfiltered spiced cider from Trader Joe’s work? Or would you recommend the plain variety? Spiced ANYTHING this time of year is so tempting! Thanks for the recipe(s)! Can’t wait! I would skip the spiced stuff because it can reduce down to be a little weird. The level of spice that tastes good at regular strength tastes a little offputting when concentrated. The plain variety would work really well! And thank YOU! Thanks Rebecca – I’m really glad I asked. It makes so much sense now. I can almost taste the yuck! Ewwww! Oh stop, this is wonderful! everything about it. I want to make this now! Thanks for sharing! The recipe calls for mild honey, I have a cranberry blossom honey on hand. Do you think that would work? I have never tried cranberry blossom honey but it sounds divine! I’m imagining that it couldn’t be bad in the Slow-Cooker Apple Cider Pulled Pork even if it isn’t super mild because cider and cranberries go so well together! Is it a fairly light or amber coloured honey? It’s more of an amber colored honey. I intend to make this dish this weekend. Will let you know how it turns out. Wow, this was amazing! I made mine in my Instant Pot (added a cup of water with the boiled cider so it would come to pressure and cooked about 2 hours) and it was SO good. That boiled cider is heavenly! I had frozen some of the pork but we pulled it out and ate it after only a week, ha! My husband heated it up in a skillet and it got a little crispy, which we loved. Thanks for sharing your recipe and the miraculous boiled cider! You are so very welcome! Thank you so much for letting me know you loved it as much as we did! I made this tonight with a few tweaks. My guys are set in the flavor they look for in pulled pork. So I slow cooked it the way I normally do. I have been dying to try this recipe so I used it for the finish sauce on half the pork. I cooked down 4 cups of cider to 1, two large spoon fulls of smoked honey and three teaspoons of honey mustard!!! Holy cow was it amazing!!! This is going to be my go to finish sauce for me from now on! Thank you for the recipe!! !